One of the reasons we love our Studebaker home in the Renaissance District is the way it allows us to be a part of the shared life of our city, and this Sunday we’ll experience a memorable opportunity for that. You may have heard that Mayor Pete is holding a major campaign announcement event on Sunday afternoon. It was originally planned as an outdoor event on Michigan Street, but due to changing weather conditions, the event has been moved inside to the train dock at the Studebaker complex, nearly adjacent to our space. This was a last-minute development that took shape late yesterday afternoon. The campaign expects a large crowd in attendance, along with national media and a large security presence. While the event doesn’t happen until the afternoon, it will begin affecting the entire neighborhood before our gatherings begin. While none of our usual parking will be available Sunday, we’ve asked the campaign to work with us to ensure convenient access for everyone attending our gatherings. 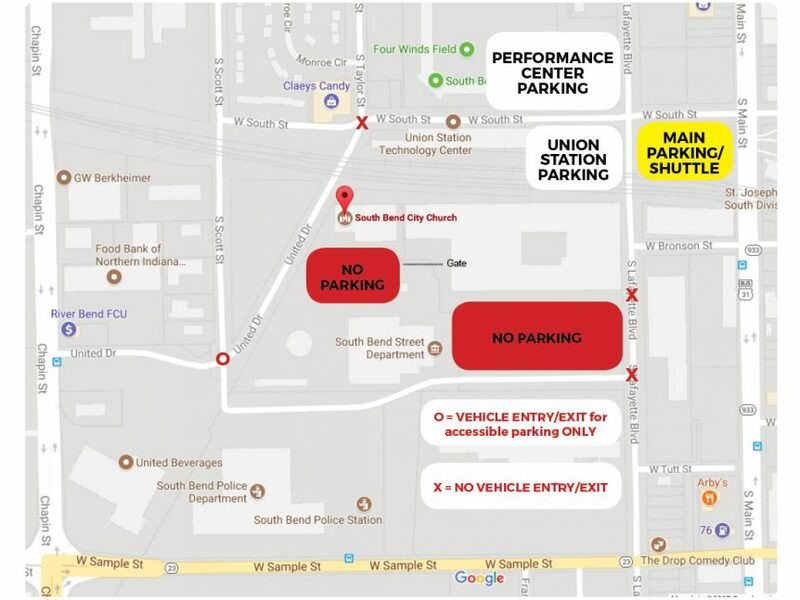 When you join us Sunday, we’ll have dedicated parking lots available at the corner of South Street and Lafayette Blvd., right by Four Winds Field and Union Station. (See the map above.) Shuttles will run constantly throughout the morning to transport you from those lots to our space and back. United Drive will also be opened so you can walk if you prefer. We know this will be an inconvenience, but we hope you’ll enjoy the buzz as national attention descends on our neighborhood. This Sunday is Palm Sunday, the day when we remember the moment when a crowd of people heaped their political hopes and expectations on Jesus. It’s the beginning of Holy Week, which takes us to the cross of Christ, and to the resurrection celebration of Easter. It’s an important time for the Church to be at her best, and we’ll have a special opportunity to do that this Sunday. Can’t wait to see you there! P.S. This weekend, we will have our normal gathering times. Check out southbendcitychurch.com for adjusted times for Easter.